Fresh snow has fallen and the Board Babe can't wait to get out on the slopes. Click here to play! Grab your snowboard and join her for a chance to race through the icy powder and win plenty of money! As this is her game, the Board Babe rules the mountains. She acts as a substitute and will replace most other symbols to help you spin in more wins. She only appears on selected reels, but she'll double your prize money if she appears in a winning combo. You'll also want to keep an eye out for the St Bernard as he comes bearing whisky to warm you up and if you can spin two to five of him you'll get up to 2500 times your line bet. There are plenty of other symbols that will make this snowboarding trip extra special, including the cabin, snowman and goggles. The first will get up to 1250 times your line bet, and the last two pay out up to 1000 times your line bet! As you'll be carving through snow, you'll definitely want some new powder to keep your adventure going. 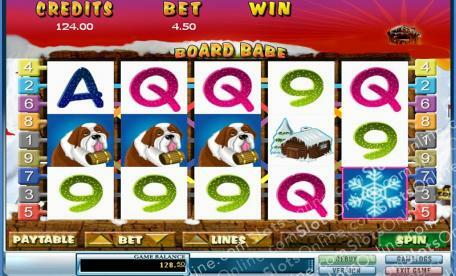 Spin the scatter snowflake and you could get up to 200 times your total bet. So, grab your board and hit the snowcapped mountains with the Board Babe for a chance at some pretty groovy cash prizes. The snowflake symbol acts as a scatter. If you spin two to five of them, you could get 1, 5, 20 or 200 times your total bet respectively. The Board Babe is a substitute. She only appears on reels 1 and 5 and will replace all other symbols, excluding scatters. She will also double prizes if she appears in a winning combinations. The Board Babe also triggers a bonus feature. If she appears anywhere on both reels 1 and 5, you will trigger a feature that allows you to snowboard down the slopes. With each obstacle you avoid, you will be rewarded points.